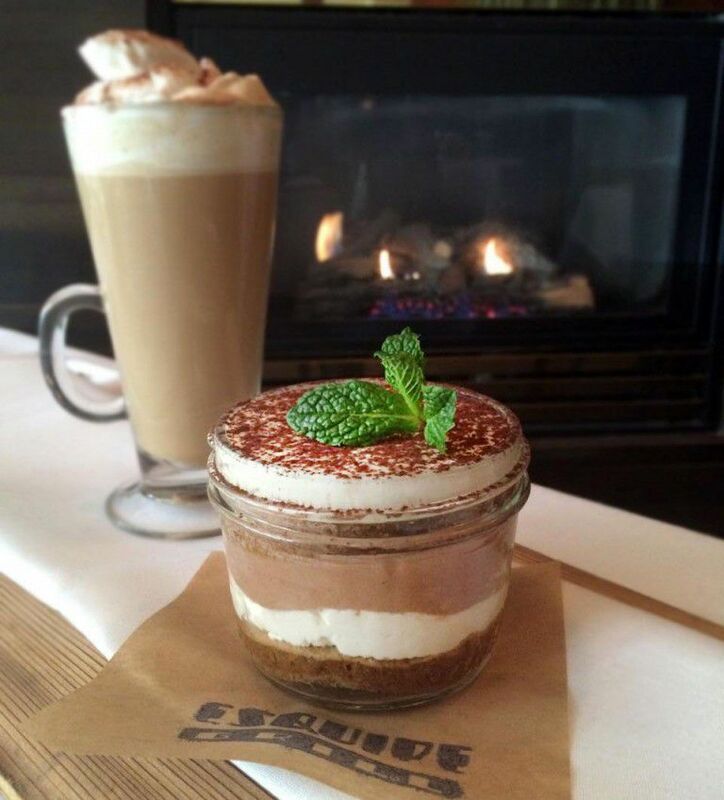 First introduced to the Esquire Grill menu during Dine Downtown 2016, this rich and creamy tiramisu was such a hit that it found a home on the main menu. Now you can indulge in this decadent chocolate dessert at home! Whip up 1 ½ cups cream to soft peaks & set aside. Melt chocolate on double broiler & set aside. Heat 1 cup cream, just to warm. On a small mixer add sugar, yolks & salt. Beat on high until light in color. Temper in the egg mix into the cream. On a low flame & whisking constantly, bring to about 155 degrees (test using a thermometer). Whisk egg/ cream mix into the chocolate & set aside to cool. Fold the chocolate into the whipped cream, ¼ at a time. (Folding with a pastry scraper or spatula works best, do not whisk). Chill to let set up. Whip up egg whites until soft peaks, slowly rain in the sugar & continue to beat until stiff peaks & set aside. Whisk egg yolks & sugar until light in color. Slowly fold in flour & baking powder assuring no clumps of flour. Once smooth, pour on to a lined baking pan & smooth out with off set spatula. Bake 350 for 5-6 minutes or until a light brown. Place all ingredients into a mixer & whisk until soft. It will take on the consistency of whipped cream. Mix espresso & dark rum. Here at ESQ we cut out the ladyfinger sheets with a cookie cutter, about 2.5 inches for individual. It’s layered as follows: Espresso-soaked lady finger, mascarpone mousse, chocolate mousse, espresso soaked lady finger, mascarpone mousse, scrapped smooth and dusted with unsweetened cocoa powder.